This time of year has been crazy with end of summer activities and trying to keep my sanity with all three boys home ALL THE TIME. So instead of creating my scones I decided to make some pumpkin scones. I had some leftover pumpkin in the freezer from the garden pumpkin I roasted and puréed last weekend. After looking around Pinterest a bit I came up with this delicious recipe from King Arthur Flour. They looked so delicious and the reviews were pretty darn good. I pretty much followed the recipe. 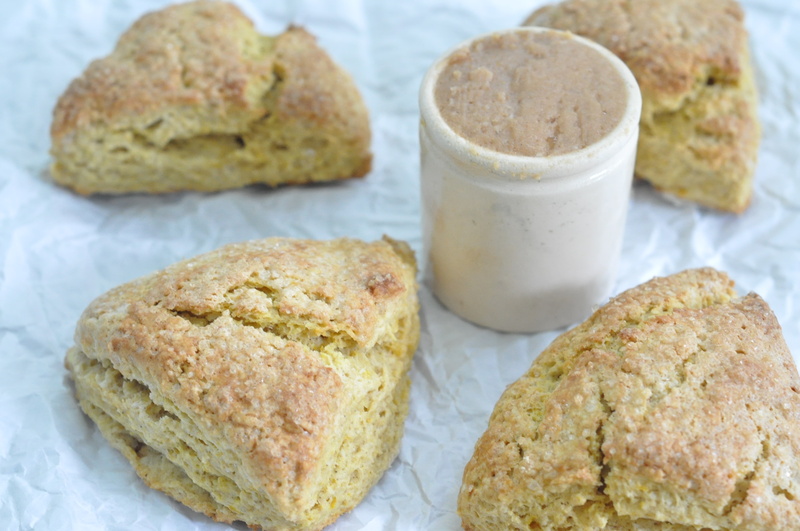 The recipe called for freezing the scones for 30 minutes before baking, I have never heard of this and was intrigued by this step. The scones certainly did rise and were light and fluffy, perhaps due to this step. The recipe also called for cinnamon chips and candied ginger, but I left my pumpkin scones plain. I had special plans for them….cinnamon maple butter. Pumpkin and cinnamon just go together, it must be a law or something! Then some sweet maple syrup and my mouth was watering just thinking about it. There is just something wonderful about a compound butter, whether sweet or savory. This one does not disappoint. 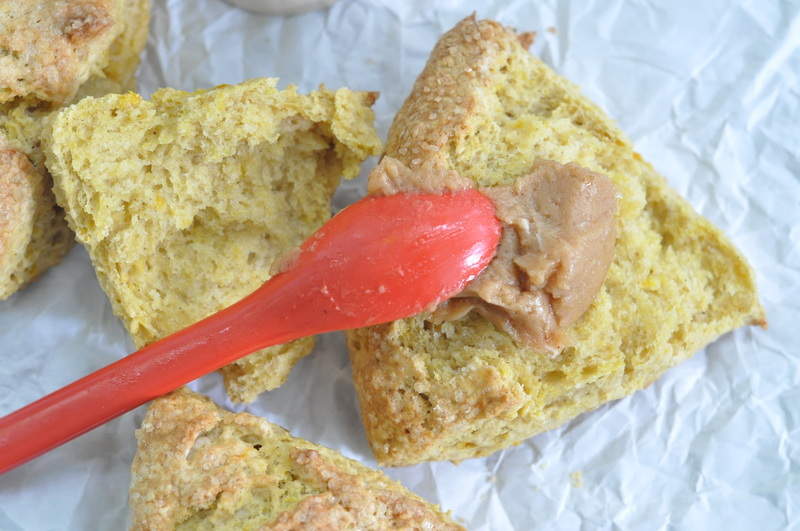 It melts so nicely on the warm pumpkin scone and provides a hint of sweetness. To say that the boys enjoyed the butter is putting it mildly. I had to take the little crock of butter with me every time I moved in the kitchen to find a container for the leftover butter since Jack was trying to eat every last bite of it! It would be safe to say we may be having pancakes or waffles in the next day or two to use some of the leftover cinnamon maple butter. Hopefully Jack won’t find it in the fridge and eat it all by himself! Bake up a batch of pumpkin scones and drown them in this butter, it is that good. 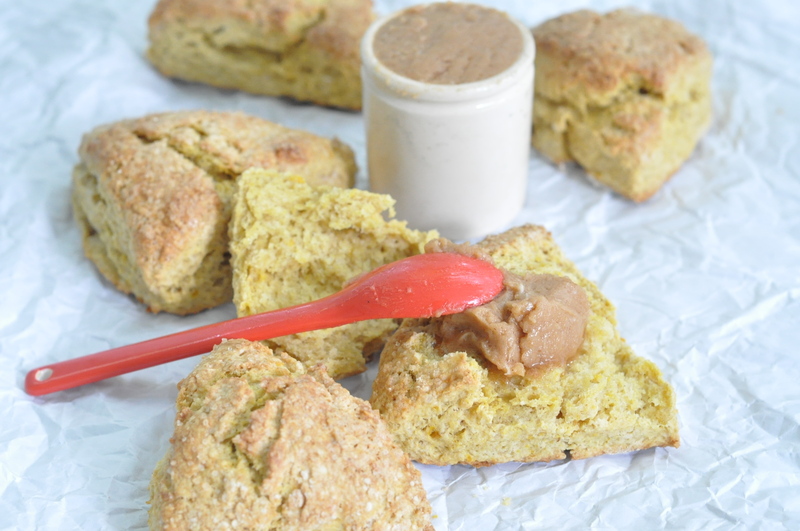 I am hoping for more pumpkins in the garden to make several more batches of these scones this fall, some with chocolate chips or cinnamon chips or maybe both…. Source: Scones slightly adapted from Arthur Flour Blog, Cinnamon Maple Butter: feedingmy3sons original recipe. Combine all the dry ingredients and sift together. Cut the butter into the dry ingredients either with your hands or a pastry blender. In a small bowl whisk together the pumpkin and eggs, stir into the dry ingredients until combined. Be careful not to overwork the dough. Divide the dough in half on a parchment paper lined sheet pan sprinkled with flour. Pat each half into a 5″ circle that is approximately 3/4″ thick. Brush the tops with cream and sprinkle with coarse sugar. Cut each circle into 6 wedges. Pull apart the wedges so that there is about 1/2″ between each wedge. Place the pan in the freezer for 30 minutes. While the dough is freezing preheat the oven to 425 degrees. Bake the scones for 22-25 minutes. Place on a cooling rack. Best eaten still warm. Whip together all the ingredients until combined. Serve on a warm scone. Leftovers can be stored in the fridge and used on pancakes, waffles, biscuits…. I remember your gluten free pumpkin scones. They looked gorgeous and reminded me how much I wanted to make pumpkin scones. The cinnamon maple butter is what really made them sublime. The freezing was new to me as well. It seemed to have worked though. Maybe I’ll try it on another scone recipe too. The butter was incredibly creamy, sweet and delicious. I may have created three little addicts with that recipe! When I saw the words pumpkin and scones together I was intrigued and the 30 mins freezer time is a helpful tip too. I hope they were all devoured and enjoyed! They were devoured very quickly! The cinnamon maple butter made them melt in your mouth delicious. Your cinnamon maple butter sounds incredible I bet it is delicious on so many things. I can tell by your pictures that your scones turned out perfectly, they look beautiful. Happy ISW! Thank you! The butter is indeed delicious on so many different things. This morning it will be on waffles. We were certainly pleased with the scones and will make them again soon. Happy ISW to you as well. They were addictive! I’ll definitely be making them several more times this fall, especially with the butter. These look absolutely delicious Gretchen! I love the sound of that cinnamon maple butter! Glad we are connected through our love of scones! The butter was fantastic! 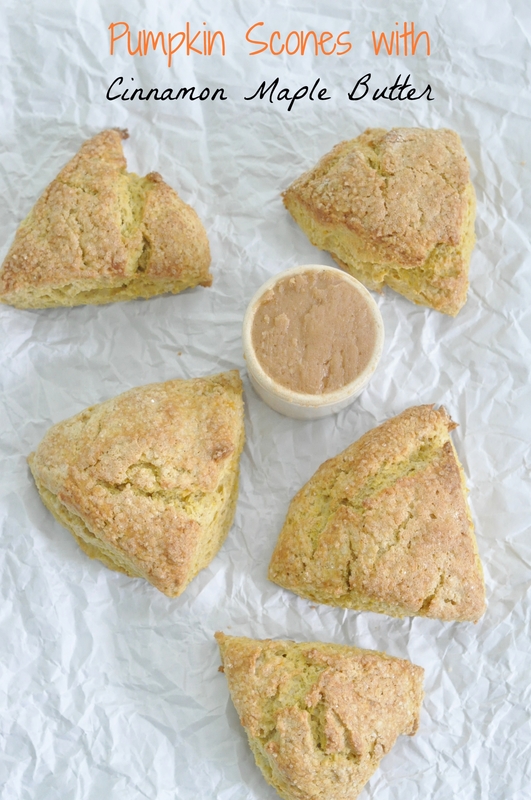 My love of scones is getting even bigger as I read all the ISW blog posts. Thanks Glenda! We will definitely make these again and I’ll be sure to hide the butter from the kids. The freezing was a bit odd but they turned out fantastic so I guess it must have helped somehow. The compound butter definitely was the star, making it again this week as the boys inhaled it already. A definite must have for autumn pumpkins! I am hoping for plenty more pumpkins in the garden by Halloween which would mean more pumpkin scones! I love, love scones. I will always gladly eat them with any filling and pumpkin sounds like a great addition. It also makes them look colourful. Thanks for sharing and the cinnamon maple butter is a great addition! The butter was fantastic. I just roasted a coup,e pumpkins and froze the purée. I’ll definitely be baking these scones again soon.